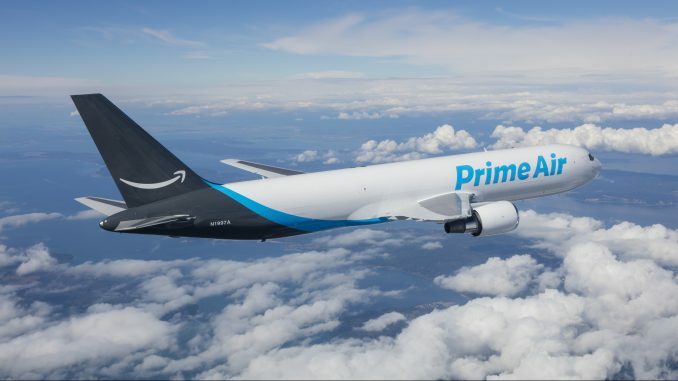 Amazon Air, previously known as ‘Amazon Prime Air’, has taken delivery of its 40th freighter aircraft, a Boeing 767-300F. The airplane, registered as N1487A, is operated by Atlas Air Inc. and was named ‘Valor’, ‘in honor of the Amazon military community’, the company says. Jeff Bezos, founder and CEO of Amazon, unveiled the aircraft at an event in Long Beach on ‘Veterans Day’ on Monday. Amazon Air’s cargo fleet is operated by Atlas Air and Air Transport Services Group in wet-lease agreements. The latter includes the two cargo airlines ABX Air and Air Transport International. The carriers operating for Amazon Air both use Boeing 767 freighter aircraft.